As teacher appreciation week continues, I wanted to bring you another great tip for working with your ELLs. There's nothing I like better than sharing tips that can make a teacher's life or planning easier! This strategy is all about helping students develop their own questions and set a purpose for learning or reading. In order to engage students in the learning process and allow them to become more independent learners, they need to be able to form and ask questions. Not just any questions will do-­‐ we need to teach students to ask high quality questions that can guide reading and learning. This strategy helps students generate questions for reading (or learning in general), giving them the opportunity to both set a purpose for reading, and to make connections with what they already know about the topic from personal experience, prior learning, or previous readings. Prior to reading, provide students with a copy of the text. Allow students to use headlines, captions, pictures, and section headings to determine the concept or topic of the reading (this is filled into the first “rung”). 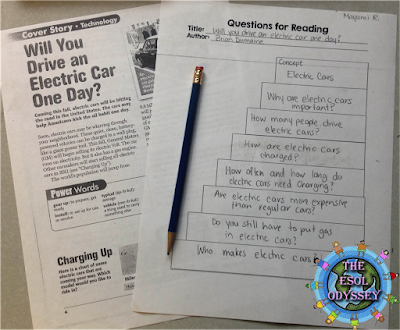 Next, students use the question ladder and work independently or in small groups to generate questions that they expect to be answered during reading. As they read and find answers to their questions, students can make notes next to each rung. Another way to use this is to provide each student with a copy of the question ladder when introducing a new unit of study. 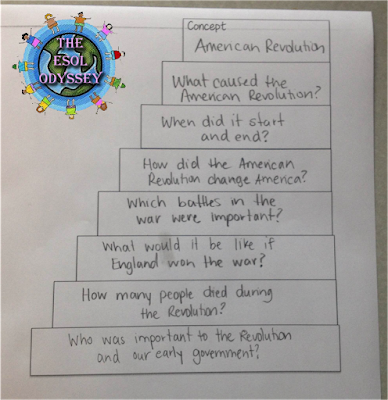 The topic of study is filled into the first “rung” on the ladder, and then students can work independently or cooperatively to generate questions they hope to have answered throughout the unit. These can be compiled on a classroom chart and as students find answers, they can make notes on post-­‐its and place these on the “rungs” of the ladder. When introducing this strategy, I recommend doing it whole-group style a few times, then in small groups, before expecting students to be able to do it independently. Beginners (WIDA levels 1/2): Add sentence frames centered around the 5 Ws and H, along with a word bank. Advanced (WIDA levels 4/5): These students should be able to form questions without language supports! I'd love to hear how you use this strategy in your classroom!